This Ferrari 458 Italia Driver Overtakes 285 Cars In 10 Minutes! - Muscle Cars Zone! This Ferrari 458 Italia Driver Overtakes 285 Cars In 10 Minutes! Among many of those super car brands, there are just a few that would make you say WOW every single time. Even though their cars are extremely expensive and most of us cannot afford one, we can at least take a look at some amazing videos of owners of such supercars. Hereby, in this very special video that lasts for 12 minutes, we take a look at the one and only Ferrari 458 Italia and the way it overtakes 258 cars in just 10 minutes. Yes, you heard it right. This amazing car had an even more amazing driver, and once you combine them together, the result is a truly exceptional video that every car fan would love. In the first couple of minutes from the video we see various close-up shots from the Ferrari 458 Italia. After this, it is time for some serious action. Namely, the driver has a GoPro mounted on his head to grab all the action even better. 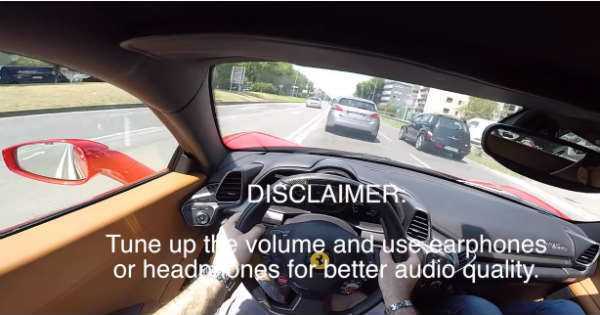 All you have to do is crank up the volume to max and enjoy in the speed and pure sound of the Ferrari. As soon as the driver hits the highway, it is time for the real deal. You can also count down the cars that they overtake to make sure that the number is actually correct. Nothing can compare or come anywhere close to this mighty car. What do you think, is this one of the best Ferrari videos you have seen? Lastly, follow this link to watch an exciting race between 2015 Tesla Model S P85D and Ferrari 458 Italia!